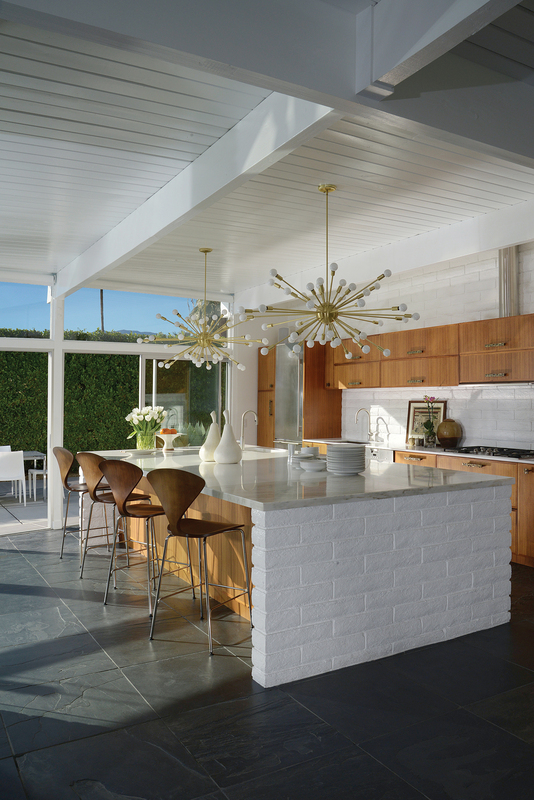 Though the architect of the 1956 La Casa di Ucello Bianca is unknown, the restored kitchen—featured in the book Unseen Midcentury Desert Modern—is an example of midcentury design that remains fresh even after six decades. Unseen Midcentury Desert Modern by Dan Chavkin, reprinted by permission of Gibbs Smith. Architect Sean Lockyer designed a 5,760-square-foot concrete, stucco, and ipe home for a couple and their three children in the Southern California desert town of Indian Wells. The residents selected the home’s furnishings, including the Royal Botania chaise lounges. The area boasts an impressive collection of work by internationally acclaimed modernist architect Richard Neutra, including his famous Kaufmann House in Palm Springs—often cited as one of the best examples of International Style residential architecture. Just outside of Palm Springs, in Desert Hot Springs, two Los Angeles designers resuscitating a down-at-the-heel John Lautner building. They spent four years shopping for furnishings, fixtures, and lighting to outfit the guest rooms, sourcing steel hardware in Hong Kong, vintage lighting in Italy and France, and many mid-century pieces in their backyard, aka Palm Springs’s renowned vintage shops. Photo by Dan Chavkin. Image courtesy of Unseen Midcentury Desert Modern by Dan Chavkin, reprinted by permission of Gibbs Smith..